Wrist blood pressure model uses Heart Sense® technology, which provides quick and comfortable blood pressure and pulse readings. Ideal for travel. 48 reading memory, automatic inflation. Comfortable, easy to apply wrist cuff, large, easy to read display . 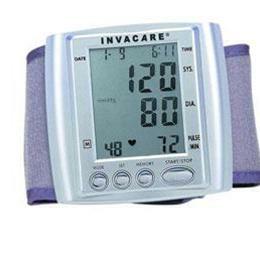 Provides systolic/diastolic and heart rate measurements with time and date stamp. English/Spanish instructions. Automatic shut off feature.